Halapoulivaati Vaitai and Isaac Seumalo have been forced to protect the edge for Carson Wentz on several occasions this season. 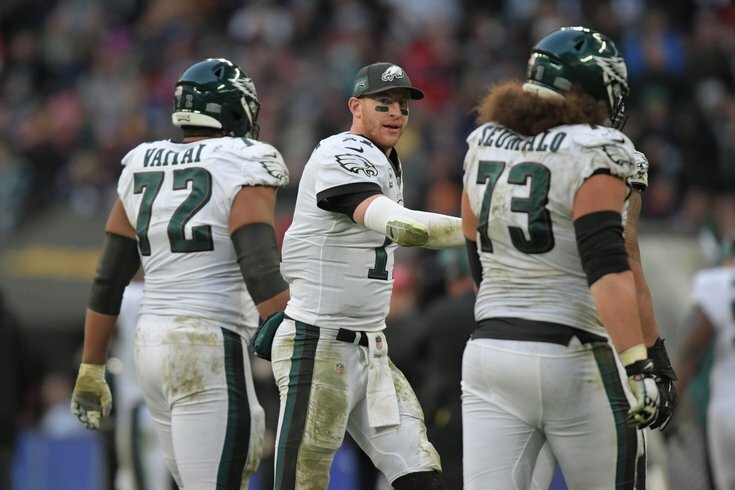 For seemingly the eighth straight week, the Philadelphia Eagles had to adjust to a variety of injuries, as they are perhaps the most banged-up team in the NFL. Here's a look at the snap counts, and how the Birds adjusted to injuries Sunday in London against the Jacksonville Jaguars. Obviously, that is not ideal. Johnson should be out for an extended period of time if reports that he has a Grade 2 MCL sprain are correct. Credit Seumalo for holding down the fort twice this season when he has been asked to play multiple positions in a game. Analysis: An interesting development this season has been the team's usage of Smallwood over Clement. Smallwood had some huge moments against the Jags, as he caught a screen that he took to the house, and he had a 10-yard game-sealing run on 2nd and 9. I'll have to wait for the re-watch to see if he was responsible for a missed blitz pickup in which Wentz was sacked by Myles Jack. Analysis: Matthews made the most of his 34 snaps, catching 4 passes for 93 yards against a banged-up Jags secondary. Analysis: All three tight ends had roles in this game. Ertz and Goedert both had touchdowns, obviously. Analysis: If there was any concern that Fletcher Cox would be wearing down at the end of games because of his heavy usage this season, he disproved that theory Sunday, when he had a monster final series, when he was able to bat a pass on third down, and cause a bad throw on fourth down to all but seal the game. Analysis: Grugier-Hill suffered a thumb injury Sunday. He had a "thumbs up" cast on in the locker room after the game. If he has to miss time, the backup WILL would be Nate Gerry, who has missed the last three games with ankle and knee injuries. Analysis: For the first time this season, Rasul Douglas got significant snaps after Jalen Mills left with a foot injury, and without having re-watched the game yet, he seemed to play well. I don't need to re-watch the game to know that slot corner Dexter McDougle had a really rough outing. The Eagles will have to evaluate that spot if Sidney Jones' return is still a ways away, because opponents are surely going to attack McDougle going forward.